The safety of our players, parents, volunteers and fans is of the highest importance to the Broken Arrow Soccer Club. Therefore, in the event of severe weather and/or lightning, play will be suspended and all persons shall leave the fields and seek shelter immediately. In the absence of lighting during rain/snow events play will continue unless the weather or field conditions warrant a suspension of play or early game termination. Play will resume AFTER the threat has passed and an official all clear as been issued. During suspension of play BASC may post live updates to the BASC Field Conditions webpage at: www.bascok.com – Click the ‘Field Condition Status’. In the event that hazardous conditions do not clear in a timely manner games may be abandoned. Abandoned games will be indicated by the referee(s) or Tournament Director. ⚽️ If the second half of the game has commenced the game is considered complete and results are final. ⚽️ If the second half of the game has not commenced the game will need to be rescheduled and replayed in its entirety. ⚽️ If the first half of the game has not commenced the game will be suspended until play may continue or as decided by the tournament director. ⚽️ The Tournament Director reserves the right to make whatever adjustments may be necessary in game length to proceed with the schedule following a delay due to inclement weather. ⚽️ Final contests will be decided on the field by completion of the game or by penalty kicks if time or conditions do not permit game completion or as decided by the Tournament Director. ⚽️ If the awards presentation is suspended, the head coach of team should present themselves immediately following the end of their contest to the headquarters tent to receive their team’s trophies and individual awards. A lighting detection system is in operation at Indian Springs Sports Complex. We ask that you adhere to any warnings the system may give regardless of how conditions may appear to be. Please use common sense with any inclement weather. ⚽️ Roof of the city barn directly west of field 3. 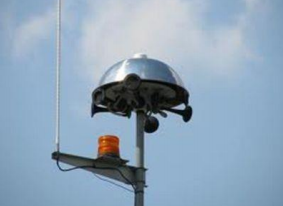 The THORGUARD sensor continuously monitors the atmosphere's electrostatic energy and evaluates the potential for lightning. When the system determines a hazardous condition, the air-horns and strobe light provide necessary alerts. ⚽️ Once the alert horn has made the warning, the system begins a 10-minute count-down. ⚽️ If conditions are cleared during the 10-minute period the system will give an all clear, if not the system will continue to recycle the 10-minute count-down process. ⚽️ Once an "all clear" condition is established by the system it will give three back to back horn blasts and the strobe light will go off. IF THE STROBE LIGHT IS ON - STAY OFF THE FIELDS! The best place to wait out the storm is in a nearby enclosed building or vehicle. Do not wait under a tree, pavilion, tent or umbrella!